Second, Carmack’s evidence is drawn from syntactic and morphosyntactic patterns (like use of –th as a verb conjugation, or use of particular prepositions following certain verbs or adjectives, such as ‘commanded of’ versus ‘commanded by’). Carmack sees these types of patterns as particularly resistant to conscious imitation and as stronger evidence for authorship (177), but I’m always a bit leery of arguments based on one kind of evidence. I’d be happier with a dose of semantic and phonetic and lexical supporting evidence. Third, most of Carmack’s evidence is statistical. A typical example is his treatment of relative pronouns referring to people; possibilities include that, which, or who/whom (193-97). Carmack notes that the KJV strongly prefers that (83.5%), and the Book of Mormon (in the earliest manuscript, prior to revisions) prefers which (52.0%), while his sample pseudo-biblical texts (chosen not by Carmack himself, but instead suggested by critics of various kinds) prefer who/whom (52-90%) or that (58%), and use which infrequently (0.0-7.8%). Carmack notes use of which as a relative pronoun with personal antecedent with a frequency similar to the Book of Mormon (54-57%) outside the KJV in works of the late 16th and early 17th centuries (194 n. 28). Carmack’s argument is that if the Book of Mormon were a pseudo-archaic text inspired by the KJV, it would closely follow the KJV’s usage patterns (preferring that) or modern usage (preferring who/whom), rather than which (as found in some early modern English works). We need to recognize that Carmack is making a statistical argument and note some cautions. There is an unlimited set of syntactic and morphosyntactic structures to examine. Are the ones Carmack focuses on representative? Are the modern pseudo-biblical texts representative of the genre? There’s no way to be sure. Carmack is not cherry-picking his evidence. The problem instead is that it’s inherently laborious to assemble this kind of data, and difficult to determine what a representative sample would look like. Imagine a hypothetical faulty argument that goes, “Croatian women are on average taller than Indonesian women. Anna is 5’ 2”, so Anna is Indonesian.” We recognize this argument is faulty because Anna represents just one draw out of two distributions that both include 5’ 2” women with reasonable frequency. Not knowing the actual distribution of heights does not strengthen your argument. Fourth, and similarly, early modern English is a very broad target. The language is not a unified entity, but differs considerably from the 15th to the 17th centuries, and from one region to another, and from author to author. Modern English, like the other languages of Europe, is the product of standardization processes that were just getting underway in the early modern period. Carmack’s parallels don’t seem to coalesce around a particular time or region or author, which is of some concern when the target space is so large. None of this means that Carmack is definitely wrong. And I’m all in favor of discovering weird new things about the Book of Mormon. But if you want to discover something weird – and a possibly angelic philologist-translator is deeply weird – then you want stronger and more varied evidence and fewer question marks. So I’m skeptical. I suspect there’s a less complicated explanation. What does it mean to learn a language? In the most basic sense, it means training a highly advanced neural network on a corpus of linguistic input while letting the network formulate, test, and revise rules through the process of communication. Knowing a language isn’t a matter of simply repeating the input back flawlessly, but instead of being able to generate new, comprehensible, and correct utterances that may never have been made before. The process requires a good amount of time and personal interaction, in the best case at least several months of immersion and usually more, even for neural networks that are immeasurably more sophisticated than anything computer science can yet contemplate. If we think in these terms about Joseph Smith’s development of a language appropriate for representing a new scriptural text, a few things are clear. The KJV would have been the primary but not the sole training corpus. There would have been little opportunity for testing and refining rules through communication. Other people developing a scriptural language in a similar environment would not have developed precisely the same set of rules. Usage patterns that differ from the KJV are to be expected, since the goal is to generate new utterances, not to repeat existing ones. Especially with the limited possibility for refinement through communication, the KJV is too small of a corpus for perfect acquisition of the language of the KJV. I suspect my basic disagreement with Carmack comes down to how language learning works. His argument relies on a language acquisition model of increasing imitation: The more heavily a modern English text was inspired by the KJV, the more closely its language would resemble the KJV; but if the text of the Book of Mormon differs substantially from both the KJV and modern English, and thus occupies a position nowhere on the transitional spectrum from modern English to KJV usage, then in this view, the text cannot have been inspired by the KJV. It’s a reasonable position. I think language acquisition is more individual, unpredictable, and chaotic, however. Rules get formulated based on partial evidence rather than careful sampling, while a disturbance in the emerging grammar might have consequences throughout the system. Could Joseph Smith’s KJV-trained scriptural language resemble particular examples of early modern English even as it differs from the KJV? Yes, I think it could. Every so often, I will remark to the neural networks in my classroom that their inconsistent marking of umlaut, or preference for the unprefixed form of past participles, or use of infinite verbs in dependent clauses, or variable placement of adverbs and verbal complements, does not agree with modern standard usage, but does have ample precedent in the early modern era (whose literature they have had no contact with). Language learning often includes the creation of overly broad rules by generalizing on one exceptional but prominent case (“Our Father which art in heaven…”). Sometimes these rules are refined with further input and testing, and sometimes they remain in place as features of a particular dialect or personal style. Even if Carmack’s work doesn’t demonstrate the involvement of a philologically-trained translator prior to Joseph Smith, his work holds value by refuting the idea that the language of the Book of Mormon is merely badly garbled KJV-speak. Carmack’s studies are opening up new insights into the mind of the prophet at the moment inspired scripture was rendered into English, and that, I think, is accomplishment enough. The book of Mormon is filled with angels. It was introduced by an angel. The book itself clarifies that angels minister by the power of the holy ghost. Joseph himself, and orders testified of the involvement of multiple angels and during their contributions to the restoration. I’ve personally received the ministering of angels who one lived on this Earth, so I can add in a small way my testimony to theirs. The book of Mormon is miraculous. I’m not sure you can exclude the ministering of angels as playing a key role on the heavenly side of the translation. It seems the most likely scenario from a position of faith actually. That’s true, libcon. Angels are already part of the scene. But that’s all the more reason to step back and remind ourselves that appeals to the supernatural are almost by definition the least parsimonious explanation in any situation, and we should be hesitant to board that train too soon. As an explanation, angels are almost comically overpowered, since there’s literally nothing you can’t explain away by saying, “That’s just what the angel said.” So you’d want to take a hard look at your evidence and search for other possibilities first before deciding that an angel (that no one was aware of or mentioned in 1829, although they mentioned plenty of others) must have been involved. Nice thoughts, Jonathan. You’re insights into language acquisition is helpful. I’d also point about that books, particularly grimoires (magic books), that had pre-KJV English were around, and could have influenced JS. Most notably Reginald Scot’s The Discoverie of Witchcraft, and John Dee’s A True and Faithful Relation. Grimoires were popular with treasure diggers. I’ll let Carmack speak for himself. Hopefully he chimes in. I think though his argument is more than Joseph would be unlikely to be using all these forms. The 16th century figure is a bit trickier. I brought up the fraud model in the other post, where Joseph is copying bits from a pre-existent text akin to a 16th century View of the Hebrews. So I don’t think the overall issue needs a 16th century angel. While I don’t buy it, those arguing for angelic influence typically suggest Moroni learned English then and so his speech patterns reflect remnants of that. As I said in the other thread though I think it interesting but think it mostly orthogonal to the types of things discussed about the Book of Mormon. To your point about cherry picking, I suspect there is an element of that. It’s akin to the problem in cancer research where a cluster of cancer can’t be easily distinguished from a coincidental statistical anomaly and some cancer causing agent. This is called the bull’s eye problem. You can find clusters, draw a bull’s eye around them, and it will appear significant. The problem is that in any mostly random data you’ll coincidentally have clusters. You get a similar problem in what’s called data dredging or p value hacking in science. The question is whether this is going on in Carmack’s data. My rejoinder would be that every new pattern Carmack finds undermines this because one is no longer using just one measure of success. Put an other way, confirming this is a process rather than just tied to a single paper. The more structures we find unexpectedly, the more likely this is. Really the problem of p hacking was what I was getting at with my critique of broad vs. narrow. Make the structure too narrow and you can find a lot of coincidental structures. It’s when you make it broader and find those to be unusual that I think it becomes much more persuasive. Thanks Jonathan (and Clark in the previous post). I’ll confess to not having dug into this stuff, mostly because it seemed weird, and not necessarily related to my areas of work. I think that your analysis here is solid, Jonathan, particularly in your summary of the problem of statistics, sampling error, and the logics of statistical analyses. It hadn’t dawned on me before reading this that Carmack might be going this direction, but within the European cunning folk tradition, from which JS’s folk practice derived, glasses/searstones/peep stones were generally enchanted so that a particular being would mediate the desired transfer of knowledge. In some rare cases that being was an angel. Do you see any evidence Carmack is evoking this tradition in his hypothesis? Thanks for this. I am… extremely skeptical of this data, and the “an angel did the actual translation” deduction. Because it makes no sense whatsoever. Steve, that’s a good point. For us, a 17th-century book is an artifact of early modern culture, but in many cases in earlier centuries, it was just a book. It’s easy to overlook how durable books are and how long their lifespan as normal books for reading can be, especially in past centuries. Clark, I think the peculiarities of the Book of Mormon’s language are – almost refreshingly – compatible with both faithful and critical approaches. Maybe it’s Joseph Smith turning revelation into language, or maybe just writing creatively, or maybe taking dictation from an angelic interlocutor, or maybe copying down a text composed by a secretive philologist. I would argue for the first option, but we don’t have to reach a conclusion before we discuss the data. Again, I don’t think Carmack is cherry picking, or even p-hacking. The problem is even more basic than that. We don’t have the equivalent of a “map” of language features, so we don’t know if Carmack’s examples are like finding 10 cancer cases in one city block, or 10 scattered across the western U.S. We don’t know the relative sizes of what’s in and outside the bull’s eye. Presumably there are language features that look like plain old modern English, and others that look like regular KJV English. But even if we knew they existed and had examples of each, we still wouldn’t know the overall distribution of each. I think the relative pronoun example gets at the heart of the problem. Carmack argues that the Book of Mormon usage (preference for ‘which’) is unlike modern usage (strong preference for ‘who’) and also unlike KJV usage (strong preference for ‘that’), so it is unlikely to be simply imitated from the KJV; the preference for ‘which’ is found in other early modern English works, however, so the Book of Mormon translator must have been familiar with that usage. My argument is that language acquisition doesn’t necessarily work through imitation based on frequency analysis. 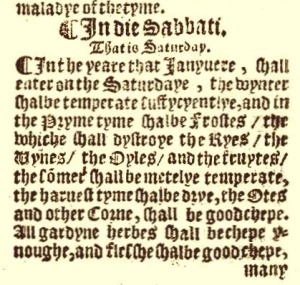 Instead, a particularly prominent example (from the Lord’s Prayer, “Our Father ‘which’ art in heaven…”) can become the basis for formulating a general rule (“Use ‘which’ as the pronoun to refer to people,”) so no further familiarity with early modern English is necessary to explain usage that departs markedly in frequency from the KJV. In the case of Scot and Dee, both were published in the mid seventh century but had been written earlier. So they still would have been old in the early 1800s, but not as old if they’d been printed when they were written. Steve, I should note that the corpuses that Carmack uses include those magical texts. The question is whether we can find texts undeniably written in the 19th century that show these grammatical structures. You can find a lot of texts tied to magic – particularly explanations of esoteric traditions that became popular in the 2cd half of the 19th century. Yet most of these structures by Carmack still don’t appear. Again I can’t claim to have done an exhaustive study, and much of my analysis consists of the poor Google corpus. But if only as a sanity check on the claims using Google is useful. But you raise the important point that I’d touched on in my post. We’re not just talking about the KJV Bible but a number of archaic yet popular texts including Shakespeare. Shakespeare is at the tail end of the period. As I mentioned he was in his 40’s when the KJV was published. Even with all these popular archaic works though, we just don’t find this language. Now an interesting argument might be that the process of the Book of Mormon accesses these structures in a way that conscious use (pseudo-KJV texts) just doesn’t. That is much as the Book of Mormon uses paraphrases and quotations of the KJV to translate different passages, perhaps these other texts ranging from Shakespeare to Hobbes, Spenser, Marlowe and so forth not to mention the esoteric texts or earlier texts like Chaucer. The question is given the influence of these texts, typically still in print, why don’t we see the grammar in publications? This gets at the distinction between published and oral works as I noted. Jonathan, I do think that while there isn’t a map per se, there are examples of the structures. The parallel to p-hacking that only Carmack could answer is how many structures he looked at and which ones he dismissed because they were found in 19th century literature. Clark, you may be reading Carmack as making a stronger statement than he actually makes. Take the example of relative pronouns with human antecedents, for example. To come up with his figures, you can’t just run a search through Google or any other corpus. You have to look at every instance (or at least a large sample) of “that,” “which,” and “who/whom” in a text, sort out which ones are being used as relative pronouns, and then decide which pronouns have human antecedents. So Carmack’s figures only apply to the Book of Mormon, the KJV, his 4 sample pseudo-biblical works, and his 2 early modern works. We can’t say anything about early modern English as a whole or other modern pseudo-biblical texts without painstakingly going through many more works. Interesting, Clark. I’d be particularly interesting in an examination of Dee’s A True and Faithful relation since I argue it was a particularly important text for Smith (after Lead and Plato) and written in the 1580s (published in 1659). Jonathan, it depends upon the paper and the structure in question. The relative pronoun issue to me was one of the lesser interesting ones – partially because I couldn’t do sanity checking in Google. For Carmack he converts the corpuses to the old Infobase format to do his analysis. If I had any time I’d load up the relevant corpuses in Python and do some analysis as there’s really good linguistically analysis libraries there. As always it’s a question of doing the right queries and having the right corpus. The other thing I want to do is look at phrases from the type of documents Steve’s been talking about as well as other early modern English against 19th century corpuses. Alas the amount of free time I have doesn’t quite match my research desires. Let’s assume that the church is organized and patterned after the kingdom of God. Let’s assume that the whole return and report thing with heavenly angels organizing, and then physically populating the earth is actually true. Let’s assume that when Woodruff saw Joseph in a heavenly vision being busy with work to do, he spoke the Truth, not just his true dreamy experience. Let’s assume that the whole idea of temple work on the otherside of the veil nvolving organizing faithful elders (and sisters) preaching the gospel to the spirit world is actually happening. Let’s assume that when we die our progression actually continues, which presupposes we will be doing *something* meaningful, besides sitting in a lecture hall. Let’s assume that for every issue, God doesn’t respond, “I got this”, but instead delegates it for the learning experiencesof his children into the eternities. All of that seems baked into the implicit cake of our faith. I’m not saying Joseph knew this, or that a word pattern search confirms it was precisely 16th century Terrence getting his wings. But I am saying with all we know about the restoration, it’s far more likely an angel was working through the Holy Ghost with Joseph than God just did everything himself directly with Joseph. Still translated by the power of God, through his authorized servants whether Joseph understood that or not. I don’t think that’s a far out claim, if it’s possibly true. It’s likely more true than anything else about how God operates even. It also explains how Mormon could channel Nephi without a or Alma without them literally recording thousands of pages that was schlepped around for hundreds of years. If that’s the likely methodology it certainly teaches it’s a lot about what happens in the spirit world. And makes more sense than God personally doing everything everywhere himself all at once. Wonderful post. Thanks for sharing it with us. I really enjoyed reading this post.